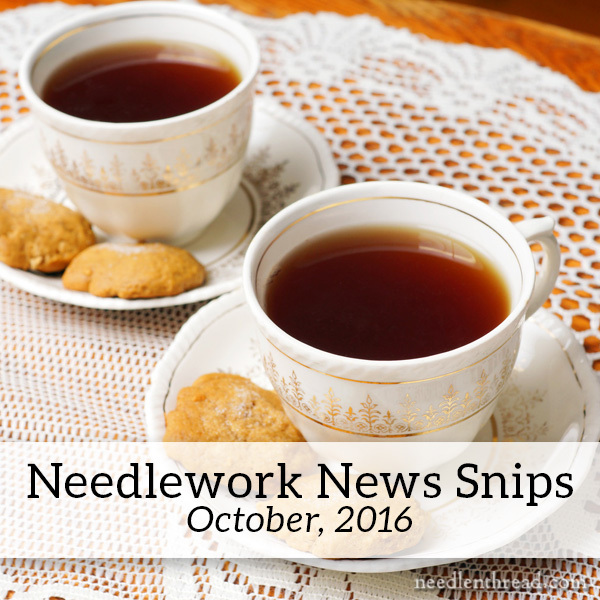 Needlework News Snips & a Winner! Brrrrrrrrrrr…… It’s finally chilly in Kansas! I love autumn. I could live in autumn for my whole life! I say that now. But when spring comes, you’ll hear me saying the same thing about spring. But I promise I’ll never say it about summer in Kansas! Summer being officially over, it’s time to move on to fallish stuff, and often, that includes fall and winter craft pursuits. In today’s needlework news snips, I’ve included a few links to some fun fall embroidery stuff, in case you want a seasonal stitching fix! I’m also happy to announce the winner of Early Hardanger Embroidery today! So, join me in a cup of your favorite brew, and let’s browse a bit! First, we’ll get some business out of the way! I probably should have asked, “What’s your current favorite embroidery stitch?” If you’re like me, it all depends on what you’re currently stitching. I’m always pretty enamored with whatever stitch I’m using! Right now my favorite stitch is the plaited braid that I learn from your printable booklet. It’s a nice stitch for many things. I make borders and vines with it in different threads and it’s looking beautiful in golden threads for large letters. I love this Hardanger stitching of old, much more than the newer styles that look heavier. The old styles of Hardanger are light and delicate. Thank you for this opportunity! Congratulations, Solange! I’m sure you’ll love Early Style Hardanger! Please drop me a line with your mailing info and the book will be on its way! If you want to know more about Early Style Hardanger, you’ll find my review for it here, with information on where to find it. Many of you wrote and asked for the old version of the Archives here on Needle ‘n Thread. You asked for it, you got it! If you go to any archived year (let’s say 2014), you’ll now find the archives clearly divided by month and post title. To get to the Needle ‘n Thread archives, in desktop view, they are found in the lower left column. In mobile view, use the “hamburger” menu in the top right, and scroll down to the end of the home page on that menu. Golly! Opus Anglicanum is a Big Topic right now in the embroidery world, thanks to the Opus Anglicanum exhibition going on at the V&A in London. If you live in the vicinity (relatively speaking) or you are planning to be in London before February 5, 2017, this exhibit of Medieval embroidery is, by all accounts, definitely worth seeing! I’ve heard from several readers who have already experienced it and who loved it! English Medieval Embroidery: Opus Anglicanum through the V&A shop – the price and shipping to the US works out to £65, which is roughly $79.50 by today’s exchange rate. You can also find the book available here through Book Depository, for &74.99 with free shipping world wide. It’s an expensive book. But not as expensive as a trip to London. I’ll be reviewing it here on Needle ‘n Thread in the next week or so. If you like medieval embroidery techniques and design styles, you will love this blog called (of all things!) Opus Anglicanum. it’s fascinating to follow and I love watching the embroidery projects on there develop. Take a look! Not quite medieval embroidery, but definitely flavored with a medieval design, Jessica’s St. Laurence embroidery project is worth following! Lots of great techniques for goldwork, Or Nué, ecclesiastical embroidery, figure embroidery…. Good stuff! Luzine Happel featured instructions for a gorgeous small plaited doily in Schwalm whitework on her website recently. What I like about it? It’s small enough to be manageable in a relatively short time frame. It’s simple. It’s crisp. It’s really pretty! I came across this pair of beautiful embroidered butterflies on the French blog of Catherine Laurencon recently. It’s embroidery eye candy at it’s best! If you’re looking for some quick autumn embroidery fun, some Halloween stitching and the like, you might like the Mill Hill Autumn Harvest Collection kits at Nordic Needle. There’s this goofy turkey guy, this adorable squirrel and this adorable squirrel, not to mention some bats and cats and witches with hats! And they have a great collection of designs for Christmas ornaments, too. You can search “Autumn Harvest Collection” to see fun little delectable things are available. I wrote about my guilty little pleasure in these little bead kits a while back. I worked a lot of them while I was convalescing – they’re perfect for stitching while vegging! Nordic Needle is currently running a special for Needle ‘n Thread readers. They’re offering free domestic shipping for orders of $50 or more, and you can use the deal for up to three orders. You can find the details here. There’s this autumn leafy corner pattern – you can see it stitched in tambour embroidery here, and you can always substitute regular chain stitch or your favorite line stitch. Want to embroidery a tiny pumpkin or two or ten? My tiny embroidered pumpkin tutorial might come in handy! If you’re looking for something ghosty and ghouly, I think this little free sheet of ghosts and ghouls for embroidery by Annie Oakleaves on Flickr is pretty cute! I’m picking up the pace on some background stuff here on Needle ‘n Thread lately, so I’ll have plenty to share with you in the upcoming weeks. And then there’s the whole Social Media World. Over the next couple months, I’ll be making use of my Social Media outlets a little more: Facebook, Pinterest, and a relatively new one for me, Instagram. If you’re on Pinterest, you can find me here. If you want to follow along with my Needle ‘n Thread related adventures, you’ll find me on Facebook here. I’m here on Instagram, and although I haven’t done much there yet, I’m playing around with it and plan to use it a bit more than I do now. Well done, Solange. You’ll really enjoy Yvette’s book. Good to see a shout-out for Tanya’s Opus Anglicanum blog, too. One of my favourite sites. Very late with this post but busy weekend. Congratulations to Solange I hope you enjoy your lovely prize. I could pop along to V&A as I live a tube journey away and can manage a day out to view the lovely medieval embroidery exhibition. I’m friends with you on FB and Pinterest but like you I’ve never used Instagram although I’ve seen a lot about it. Must explore this. Thanks for all the snippetsand for sharing them with us this weekend and I can’t wait for the future posts. The Opus Anglicanum site has been my go to resource while stitching a massive (140″×60″) Bayaux Tapestry kit this year! Her luttrel psalter projects are absolutely incredible with such perfect stitching…and the captions and names she gives each little creature and beast are so funny! I ended up loving bayaux stitch so much I’m now working on #2 of 4 scenes.